UPDATED: JUL 20, 2018 Nose chocolate and some coffee with sweet background. Taste also sweetish but rather light. Palate medium long with caramel notes. 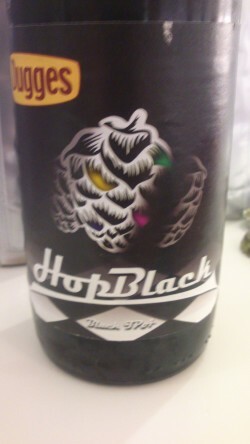 First ever Black IPA for me, it did make an impression. Dark brown, almsot black color. Aroma has a sweet, fruity hop rather than citrus. Taste is sweet with a nice toasted malt base, and then a long, medium bitter finish. I like it! Bottle from Rehills of Jesmond in Newcastle. A fair few months out of date despite only just being bought. Pours deep brown, almost black with a beige head that fades to a light rim. Slightly musty aroma of choclate and pine. The taste is coffe and pine. Quite a nicely bitter finish. Noce but definitely a bit stale. Will have to try a fresher bottle if I come accross it again. Black colour, red hue, off-white head. Aroma of roasted malts, old coffee, light drain, hint red fruits. Light bitter flavour, malts, coffee and hops. Finish coffee, hops and roasted malts. Bottle from Rehills, Newcastle. A hazy very dark brown-black beer that has a rich citrus fruit and coffee flavour, oak and vanilla notes followed by pine and grapefruit on the finish. Excellent! (Bottle) Black colour with big, frothy, beige head, leaving traces of lacing. Malty, roasted nose with notes of black-currant, liquorice, grapefruit, a touch of smoke and hints of tropical fruit. Malty, roasted, hoppy taste with dark berries (black-currant, blackberries), dried fruit, liquorice, dark chocolate, pine needles and a generous citric, piney bitterness in the finish. Medium body, with a touch of sweetness. Solid and well made black IPA. Very nice. hazy dark pitch brown with resinous chocolate nose. Fairly robust bitterness with pine and marmelade notes. V easy drinking for abv but without hop impact of some BIPAs dulled a bit by heavy dark malts perhaps.